Interpine has recently undertaken a project to implement PlotSafe and YTGen within Mexico. 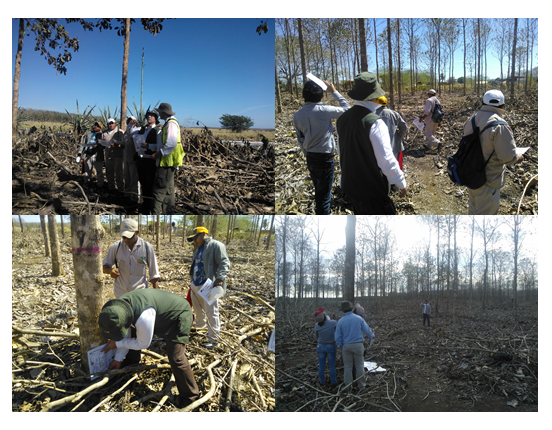 The trip offered great interaction with local staff, and proved that good forest inventory measurement practices are internationally recognised principals. Language is often not a barrier to the understanding with many of the core principals well understood and used. Figure 1 – PlotSafe training and development of stem feature assessment. The main purpose of the trip was designed to train and educate technical staff in stem feature cruising techniques and the use of YTGen and PlotSafe. This proved extremely successful despite some staff members had never been involved with the use of field computers before. Having PlotSafe available in Spanish on the handheld computers was a major benefit, and field staff quickly found interaction and data entry within PlotSafe easy. They were (despite lack of initial computer skills) running the system within a couple of days from the start of training. The Spanish version of PlotSafe was used during the training and is now being deployed. This has proved invaluable to ease the language barrier and improve adoption of the software. If you have any questions or queries feel free to contact our team.